Not too surprising, at least to me, is that there are a lot of people struggling with how to best manage overgrown shrubs. 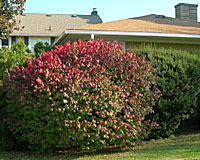 Specifically, visitors to this site want to know how to control the size of burning bush, at right, rose-of-Sharon, and evergreen trees and shrubs. Visitors also want to know when and how far back to prune butterfly bush! Hand-in-hand with the above concern are questions relating to the creation of privacy in landscape settings. My sense is that a lot of people planted the above shrubs, especially evergreens, at left, in an attempt to create a sense of privacy in their garden? However, some years later, they're now trying to figure out how to deal with trees and shrubs that are much too large for the spaces in which they were planted! In response to these concerns, click on the links at right for more my thoughts on addressing each of these issues. By the way, if you do a search to find information on the topics at right, you'll quite possibly find that links to the pages on this site have made it to the first results page of many of the major search engines! Each winter, the Central New York State Nursery & Landscape Association delivers an educational program for its members and other "green" industry representatives including golf course superintendents, landscape architects, institutional grounds maintenance staff, and others. This coming January 30th, the focus of this annual conference will be on water quality. It will feature a full day of presentations on a range of techniques that green industry professionals can implement to enhance the quality of surface and ground water that's influenced by their client's properties. And, it will offer a range of professional continuing education units and recertification credits for a variety of professions. For more information on this program, click on the link at right. 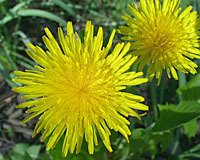 Shredded Maple Leaves May Prevent Dandelions in Lawns? If you've spent time on this website, you probably know that I encourage everyone to mow tree leaves into their lawn in the fall instead of raking them to the curb for municipal collection - which is a complete waste of tax dollars, in my humble opinion. For many years, research at several universities has shown that shredded leaves can improve the condition of lawns over time by returning organic matter and nutrients to the soil. Now, researchers at Michigan State University, where much of the original research on the effect of tree leaves on lawns was conducted, are taking a closer look at the possible herbicidal activity of chemicals leaching out from shredded maple leaves. Initial observations suggest that these naturally-occurring chemicals can significantly reduce dandelion seed germination in lawns! To read more about this work, click on the link, above right, to open a .pdf version of the Winter 2007 issue of Michigan State University's Project GREEEN (no, that's not a typo), "Issue, Impact, Action" newsletter. I know it seems sort of silly to start mentioning flower and garden shows that are almost six months - and likely well over one hundred inches of snow - away! Yet, members of the Western New York State Nursery and Landscape Association, the GardenScape Professionals Association, the Central New York State Nursery and Landscape Association, and the Northeastern New York State Nursery and Landscape Association, are already hard at work planning for these major events. So, since I know how disappointed you'd be if you accidentally made plans to spend a couple of weeks vacationing in the Caribbean and missed out on these great events, I figured I'd be doing you a service by helping you get these dates in your calendar now! What started out as a bit of experiment has become a modest success. With little fanfare, other than the announcement of their availability on this website and mention during the eight "Lush Lawns" presentations I made at libraries throughout Onondaga County in August, hundreds of pounds of "Terry's Best" Sunny and Shady lawn seed mixes have been used to overseed and renovate more than a dozen lawns throughout Central New York. More surprisingly, because of the partnership with Drew Kinder and his company, the Seed Super Store in Buffalo, these mixes have found there way onto lawns near West Point, out on Long Island and in Ohio, Pennsylvania, New Jersey, and Virginia. A couple of pounds were even shipped as far south as Atlanta, Georgia! However, as the saying goes, "all good things must come to an end." Because I'm a strong believer that there's a very specific time of year for successful, high quality lawn establishment, renovation and/or overseeding (that being between the middle of August and middle of September), we've ended the shipping season for these lawn seed mixes. Between now and next July we'll evaluate the process for ordering and delivering the seed. We'll talk with customers to see if the mixes have met their expectations. And we'll take a hard look at the performance of the latest Kentucky bluegrass, fine fescue and perennial ryegrass varieties to see if they warrant inclusion in these premium seed mixes. 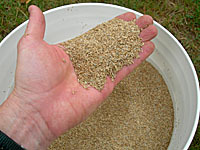 So, while you can no longer order "Terry's Best" sunny and shady lawn seed mixes this year, please do click on the link at right to learn more about them. 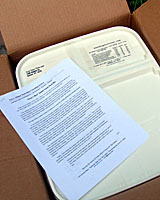 And, make plans now to place your order as soon as they become available in July of 2008! Several weeks ago I mentioned on this page (scroll down this page) that my wife, Beth, and I would be traveling to Buffalo during the last week in August to attend the "GardenWalk" garden tour. Well, we did, and our conclusion is that it's one of the most extraordinary horticulture-related events we've ever attended (and, as you might imagine, I've attended A LOT of events over the years). I visited more than sixty (yes, that's 60) gardens, and saw less than 25% of all the gardens on the tour! Gardening has the power to create a stronger sense of community and neighborhood pride than any other activity I can think of! Worst Weeds in Landscape Plantings! Dealing with weeds is probably the worst part of gardening. This task is even worse when you're attempting to control an especially aggressive weed such as goutweed, at right (which more than a few people unwittingly import into their garden as tiny root pieces hidden among the roots of a "gift plant" from friends, family or neighbors)! To learn more about some of the most invasive and difficult-to-control weeds in Central New York landscapes and gardens, click on the link at right. 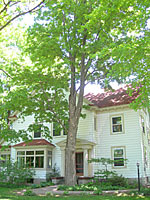 Your Tree(s) May Be In Trouble If . . . .
About a month ago, I met with a couple to discuss the condition of the trees surrounding an older home that they'd just purchased. Many of the trees were quite old, quite large, quite close to their home, and - unfortunately - displaying various symptoms associated with potential failure during a summer thunderstorm or winter ice storm. While many conditions associated with tree failure are pretty obvious, at left, others are almost undetectable - unless you know what you're looking for. So, if you have trees on your property - and especially trees that will cause damage to targets on the ground if they fail during a storm, click on the link at right to learn more about twenty different potentially hazardous conditions that might be affecting your trees! 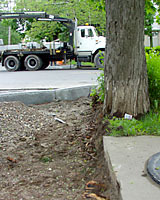 Bad Idea to Plant American Elms Along CNY Streets? Despite the romantic notion of towering "cathedrals" of American elms arching over the streets of cities, towns and villages across Central New York, I don't think it's a very good idea. 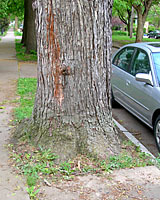 First, and foremost, the various American elm varieties currently in the news - including `Princeton,' `Valley Forge,' `Delaware,' `New Harmony,' `Independence,' and others - are Dutch Elm Disease (DED) - "tolerant", NOT "resistant!" Research reported in March 2005 issue of the Journal of Environmental Horticulture (.pdf file link at right), indicates that all of these varieties can be infected by the fungus that causes the disease. The key to their survival is that they're capable of limiting the internal spread of the infection when growing vigorously. Because conditions along modern city streets are often very stressful (photo at right), it's possible that these "tolerant" varieties may not be so tolerant of DED infections when stressed? I would also think twice before planting DED-tolerant American elms along city streets because they're simply very large trees - assuming they live to maturity! All of the varieties mention above, for example, can grow anywhere from fifty to eighty feet tall and wide, with trunks that can easily be four to five feet in diameter - or larger! Considering that there's often no more than five feet between the street curb and sidewalk in many neighborhoods, just where, exactly, are these trees going to be planted? And, finally, while these trees may be relatively tolerant of infection by the DED fungus, they remain susceptible to a wide range of nuisance insect pests and diseases that can trigger early summer leaf drop, dripping of sticky "honeydew" onto cars parked beneath these trees, a constant barrage of small twigs and stems that break out these trees during moderate breezes, etc. Newsradio 570 WSYR Blog in the Works Goes Live! That's right - my "blog" at 570wsyr.com went live Friday morning, May 11th! If putting together my first post is any indication, it should be pretty easy to add quick comments, observations, links to specific pages on this website and others, pictures, etc., several times a week. I think it will be an especially good place to provide follow information to questions that I receive during the program. Who knows, maybe once I've figured out how to add information quickly, I might even be able to update it during the show? So, check it out and drop me a line to let me know what you think! If you have a passion for a particular plant or group of plants or just enjoy sharing your growing joys and sorrows, there are groups of like-minded gardeners all across Central New York. Below is just a sampling of these groups along with the most recent contact information that I can find - including websites, if available - above, at right. If you're aware of a group that's not included here, or have updated contact information for a listed group, click on the "Contact" link at the bottom of this page to send me a note. Founded in 1911, this is the oldest rose society in continuous existence in the United States! It's also probably one of the busiest as its members maintain one of the larger public rose gardens in the eastern U.S. For more information, click on the link to the group's website, at right. Despite its name, this club welcomes women, too. In fact, if I'm not mistaken, most of the group's officers are currently women (whom I understand are much better at getting things done)! 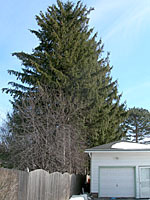 The club is very active in a number of local public gardening efforts. For more information, call 315-727-2182. Orchids are considered to be among the most exotic of all cultivated plants. And, while many are very difficult to grow, others are surprisingly easy. If you'd like to learn more about growing this fascinating group of plants, this organization features an enthusiastic, knowledgeable, helpful and active membership! For more information, click on the link to this group's informative website, at right. Bonsai are right at the top of my list of fascinating plants. This is not only because the depiction of oftentimes very large plants in miniature, but also because many of the most common bonsai actually need exposure to cold temperatures over the winter months to thrive. If you'd like to learn more about this group, click on the link to their website at right. A habitat garden provides the same kinds of things for birds, butterflies, and other creatures that people need in their own "habitat": food, cover, water, and a place to raise young in a healthy environment. These requirements can be met even in small spaces with careful planning. This group of very dedicated habitat gardeners can help you learn how to create a sanctuary for all sorts of critters that's also visually stunning throughout the year! 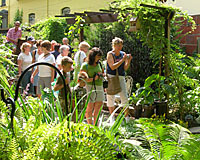 Their "Show Me, Help Me" summer garden tours can be especially helpful - and fun, too! For more information, click on the link at right.